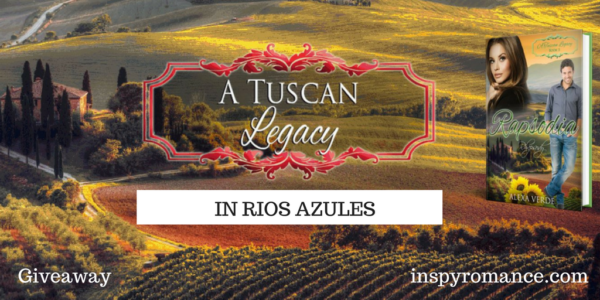 We’ve traveled to Tuscany a lot at Inspy Romance lately with A Tuscan Legacy series, but why break tradition of giveaways and excerpts? Besides, I’m thrilled to share my contribution to the series with readers. 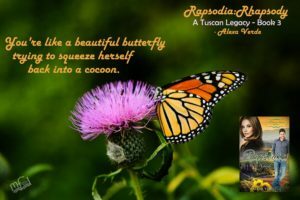 As I feel at home at Inspy, I’d love for you to help me celebrate my new release, Rapsodia. 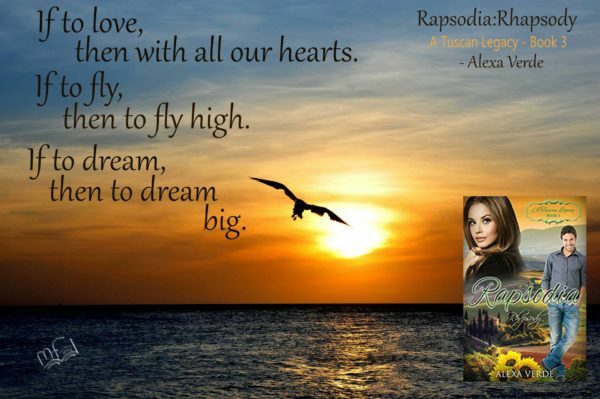 Rapsodia is a story about faith, love, surrender, heartbreak, risk, trust, friendship, and so much more! You’ll see below the hero’s motto. What would be your motto in life? What is your dream? Rapsodia is currently only 99 cents (free with Kindle Unlimited). By the way, today is the last day Book 1 in the series, That’s Amore by Marion Ueckermann, is still at $0.99, and the price for Book 2, Luna Rosa by Elizabeth Maddrey, will increase soon, too! Giveaway! One randomly chosen commenter to this post will receive Kindle copies of entire Rios Azules Christmas series (3 full-length novels: Season of Miracles, Season of Joy, and Season of Hope). Ebooks will be gifted via BookFunnel. Giveaway is open until 9 p.m. on May 10th. Many thanks for the graphics to Marylin Furumasu www.mfurumasu.wix.com/mfliteraryworks. Without further ado, the excerpt. I hope you’ll enjoy reading it! The plane moved, jerked forward, and shook somewhat. Marco’s grip on the armrest tightened to the point his knuckles went white. This was torture. That made exactly one of them. The plane tore off the ground, and the pressure in his ears increased. For a moment, he forgot about takeoff. He sure hoped it wasn’t a hint that his breath was foul. “Chewing gum helps so your ears don’t get plugged from the change in the air pressure.” She gave him a half smile. “Thanks.” He took the gum, opened the wrapper, and popped the white stick into his mouth. He chewed in earnest, enjoying its fresh taste. Samantha had a point. They were airborne, but the pressure in his ears wasn’t nearly as bad as usual. The airplane bell dinged. They could unbuckle their seat belts. Marco breathed a tad easier. “So, you like to control a situation?” The same half smile appeared on her lips as she clicked her seat belt open. Marco nodded. He did, though at the same time, he encouraged his employees to take initiative to a point and awarded innovation. Why was it so easy for him to move millions of dollars but so difficult to trust the pilot to guide the airplane? The old man near him started snoring underneath the newspaper. Most likely, he’d sleep through the entire flight. “What about you?” Marco studied Samantha. Marco tensed at the pain in her eyes. Something had happened to her. Something very, very bad. A small-town girl. Her clothes were simple, her conversation unpretentious, and she didn’t wear a speck of makeup. He liked that. But it didn’t make any sense to become attracted to someone who lived half a state away from him. And Texas was a very large state. Besides, he lived and breathed his job, and romance wasn’t on his personal menu. His life was guided by logic and smart decisions, not feelings, and that was what had gotten him this far. Huh. Classical music wasn’t a popular choice these days. “Used to play violin?” He picked up on her use of the past tense. She probably didn’t have time for the violin anymore, like he didn’t for piano. He hadn’t played in years. But he’d love to play something for her someday. Maybe a rhapsody. Whoa. He was getting ahead of himself. “Yes. Used to. I… can’t anymore.” She looked away. “What kind of movies do you like?” she asked as if trying to change the topic. He perked up. “Wow. You just read my mind.” Samantha was totally his kind of girl. Stop. No thinking like that. As if on cue, the scents of broiled chicken and spaghetti sauce drifted to him. He opted for pasta while Samantha chose chicken. He touched his neighbor’s elbow on the left to wake him for dinner, but the man only snored louder. Samantha bowed her head, and her lips were moving, as if she was saying something in her mind. Was she praying? Marco’s heart warmed up at the sign of her being a Christian. He tried his food. The pasta tasted rubbery, and the watered-down sauce was a far cry from the deliciousness he was used to. But the salad was fresh, and the small chocolate dessert tasted sweet and soft. Samantha’s chicken didn’t look too appetizing, either, but she was devouring it with gusto. He got carried away. He’d never see her again after this flight. The thought made the sweet taste of orange juice turn bitter in his mouth. Once the initial ice in her eyes had melted, she seemed to be genuine, lovely, and friendly. However, she did have an aura of sadness around her, and he wondered what her story was. “How is your food?” he asked Samantha. “Okay. I’ve seen people existing on a small bowl of rice a day, if that much. I learned to appreciate any kind of food. This is not bad.” She put another piece of chicken in her mouth. She seemed to swallow the piece, but suddenly her eyes widened, and she started coughing profusely. It looked like something had gotten stuck in her windpipe. Eyes watering, she clutched her hands to her throat, as if unable to say a word, showing him the universal sign of choking. Cold ran down his spine. Hi Wemble! Yay! I’m so glad you enjoyed Marco and Samantha’s story, and huge thanks for your kind words about the series! I love it, too, and I’m so grateful to be part of it. I loved Marco and Samantha’s story, but then, having worked with Marco in That’s Amore (book 1), I was already crazy about him as a hero. You’re so sweet, Marion! Thank you from the bottom of my heart! Hi Alexa! Enjoying my visit to Tuscany. Well written and developed series. Also just finished reading Season of Joy. Best wishes and congratulations to all the authors on their releases over the coming weeks. Good morning, Alexa! I have enjoyed all your books so far, so I am sure I will live this one too! Thank you for sharing! Hello Lila Diller! Happy to see you here, and many thanks for your kind words about my new book! It was nice to cyber-meet you last night, too! My grandparents use to live in San Antonio beautiful city. Thank you for stopping by, Kim Hansen! I love San Antonio! Once upon a time, I was even thinking of moving there. You’re so rigt. A very beautiful city! I can’t want to read the entire series. Hello Colleen! Yay! I hope you’ll enjoy reading A Tuscan Legacy series. Thank you very much for commenting! I am sure I will. I bought all the books. Thanks for the excerpt! So fun…. I have been truly enjoying this whole series. I loved how Marco is sort of a bigger than life hunk, and yet he has a fear of flying. Then Samantha, who is dealing with some pretty tough issues of loss and feeling like she doesn’t have the right to be happy. Oh! The chemistry between these two is so intense. It was sweet to read how they overcame their issues with God’s help. Thanks, Alexa for writing such wonderful characters who we can relate to and learn from. I’m looking forward to reading all the books. This is a great way to end my school year and begin my summer vacation. Hello Marylin! Thank you for your wonderful words and a great review of Rapsodia! They made my heart sing. And huge thanks for all beautiful graphics you created for our series! I love them. Hey Alexa, great way for the h & h to meet. You made him a hero right from the get go. Hello Shannon! Thank you! Your words made me smile. It was a little embarrassing for Samantha, but she’ll get over it quickly. I appreciate you stopping by! It’s a wonderful book, Alexa! The great reviews show how much readers love it, too! You’re so sweet, Autumn! And I’m immensely grateful for readers’ response! I adored reading this last week – and am impatiently trying to figure out when I can start reading the next one. Thank you very much, Amy J! Got to love armchair travel. Thank you. Hello Mary Preston! These days, I prefer arm travel, too. And it’s so much fun to travel via books! Thank you for commenting!